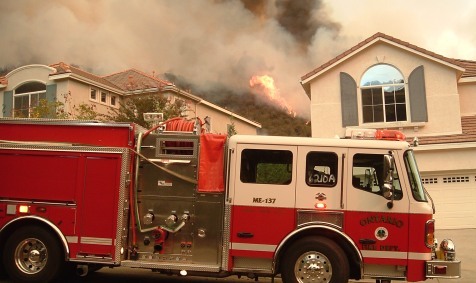 Ontario is prone to wildfires associated with high "Santa Ana Winds". Severe windstorms can pose a significant risk to property and life in the region by creating conditions that disrupt essential systems such as public utilities, telecommunications, and transportation routes. High winds, including Santa Ana winds, can cause damage to homes, businesses, landscaping, public property and utilities, and pose threats to public safety, including accelerating a fire. The alluvial sand that underlies the majority of Ontario is generally granular, poorly consolidated, and very susceptible to erosion. In strong winds this sand can impact property, air quality and visibility. Reduced risk of injury, property damage and economic loss resulting from windstorms and wind-related hazards. Backup Power in Critical Facilities. We require backup power be maintained in critical facilities. Dust Control Measures. We require the implementation of Best Management Practices for dust control at all excavation and grading projects. Grading in High Winds. We prohibit excavation and grading during strong wind conditions, as defined by the Building Code.